So with only 4 weeks left I thought I would let you know that just like last year I am running my Christmas Wish List Service again. It works like this, you make a wish list (if you are like me everything between the catalogue covers) you email it to me then you simply pass on my details to all your loved ones, friends and family members, sons, daughters, husbands and aunties. I will then work closely with them to pick your special gift, beautifully wrap it and deliver it ready to be offered to you on the big day. Your loved ones will appreciate not having to go out face the crowds and scratch their heads on what to actually buy you and you will absolutely love unwrapping something that you are sure to like and want but still have it as a total surprise. Love it! Or how about getting your fabulous Santa to really spoil you this Christmas? Get him/her to treat you to a weekend of pure crafting fun. Our Stamp With Us Retreats are the perfect gift idea for any crafting goddess, they offer fabulous value for money and a lot of fun is guaranteed you get to choose between Stratford in February and Guildford in March. Oh and every single order will get a little present from myself , well Christmas is the time for giving isn't it? Contact me for more details on telemech01ataol.com. Now I really haven't had time to stamp just lately and I am absolutely itching ( I really hate it when life gets in the way of stamping), but it will all change though cos I will be in that craft room tomorrow for a few hours, I cannot wait. So while I was looking through my photos to see what I can share with you today I noticed that I haven't posted the last project I designed for Stamp With Us Online classes. I really loved how this turned out. 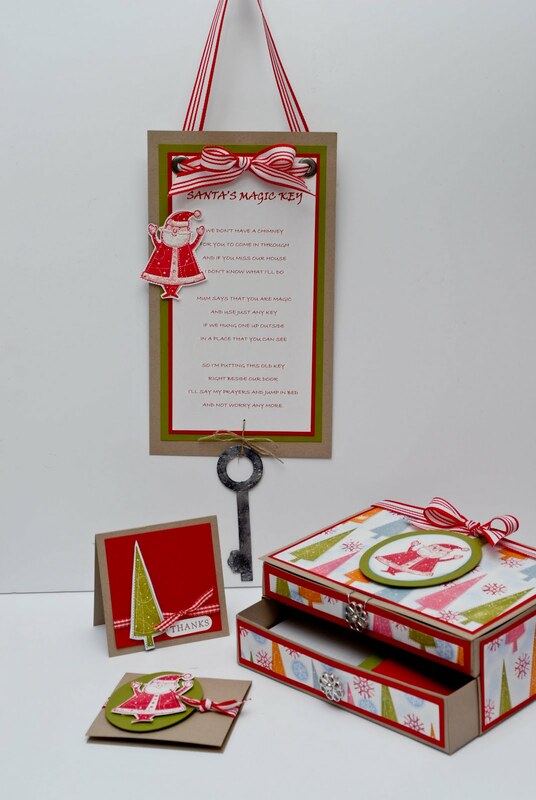 A lovely door hanger with a sweet poem complete with a magic key, then a sweet lidded box that has a drawer on the bottom. Now the idea for this set was that it would the perfect gift for a little budding crafter. The door sign perfect to hang outside for Santa to use the key and get in if you haven't got a chimney, and the box filled with a mini craft kit that would keep him/her entertained for a good few hours having fun stamping his/hers own thank you notes. Well you do need to thank Santa and auntie Mary for all those pressies don't you? 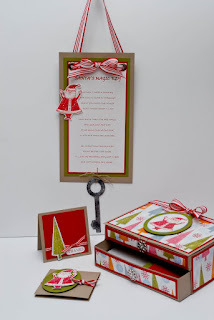 I have used the gorgeous A Jolly Holly Christmas stamp set and a lot of inks to stamp my funky pattern paper. Regal Rose, Old Olive, Bordering Blue,Pumpkin Pie and I sponged the white in between with Bashful Blue. A view of the top of the box, I just love the trees in different colours and the little snowflakes came from the Snow Flurries, set a very useful and inexpensive stamp set. And of course we must not forget the ribbon which is just delish don't you agree? Wow fabulous creations Monica. I love the Santas key idea. Your projects are always so awesome Monica...tfs!!! Absolutely fabulous! Love the projects and the poem!